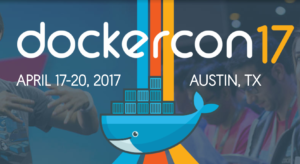 The DockerCon Scoop - Containers, Kubernetes and more! Ahhh DockerCon, the annual convention for khaki pant enthusiasts. Oh, wait, not that Docker. Last week DockerCon kicked off with 5500 Developers, IT Ops Engineers and enterprise professionals from across the globe. With the announcement of new features like LinuxKit and the Moby project, Docker is doubling down on creating tools that enable mass innovation while simplifying and accelerating the speed of the delivery cycle. Docker is starting to turn a corner, becoming a mature platform for creating mission-critical, Enterprise class applications. Throughout all of this, monitoring and visibility into your infrastructure continues to be critical to success. In the world of containers, there are three trends we are seeing here at Sumo Logic. First, is the rapid migration to containers. Containers provide great portability of code and easier deployments. Second is the need for visibility. While migrating to containers have simplified the deployment process, it is definitely a double-edged sword. 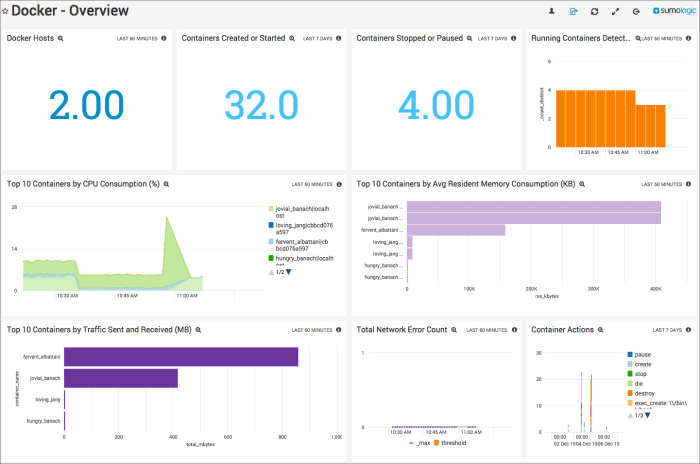 The ability to monitor your containers health, access the container logs and monitor the cluster on which your containers run is critical to maintaining the health of your application. The last trend is the desire to consolidate tools. You may have numerous tools helping you monitor your applications. Having multiple tools introduces “swivel chair” syndrome, where you have to switch back and forth between different tools to help diagnose issues as they are happening. You may start with a tool showing you some metrics on CPU and memory, indicating something is going wrong. Metrics only give you part of the visibility you need. You need to turn to your logs to figure out why this is happening. 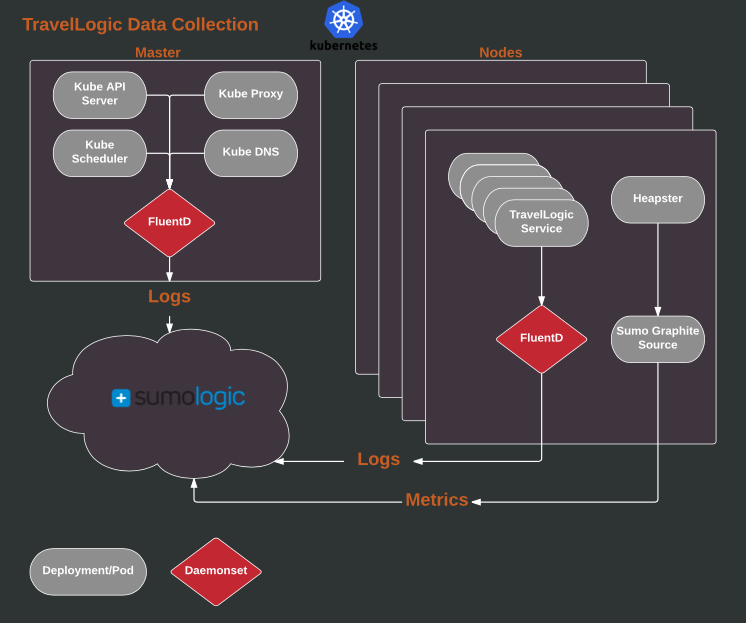 Sumo Logic’s Unified Logs and Metrics are here to help give you full visibility into your applications. To effectively monitor your applications, you need the whole picture. Metrics give you insights into what is happening, and logs give you insights into why. The union of these two allow you to perform root cause analysis on production issues to quickly address the problem. Sumo Logic can quickly give you visibility into your Docker containers leveraging our Docker Logs and Docker Stats sources. Our Docker application allows you to gain immediate visibility into the performance of your containers across all of your Docker hosts. At DockerCon, we saw an increased use of Kubernetes and we received many questions on how to collect data from Kubernetes clusters. We have created a demo environment that is fully monitored by Sumo Logic. This demo environment is a modern application leveraging a micro-services architecture running in containers on Kubernetes. So how do we collect that data? Well, the below diagram helps illustrate that. We created a FluentD plugin to gather the logs from the nodes in the cluster and enrich them with metadata available in Kubernetes. This metadata can be pulled into Sumo Logic giving you increased ability to search and mine your data. We run the FluentD plugin as a Daemonset which ensures we collect all the logs for every node in our cluster. For metrics, we are leveraging Heapster’s ability to output to a Graphite sink and using a Graphite Source on our collector to get the metrics into Sumo Logic. Since Heapster can monitor metrics at the cluster, container and node level, we just need to run it and the collector as a deployment to get access to all the metrics that Heapster has to offer. What if you are not running in Kubernetes? In a previous post, we discussed multiple ways to collect logs from containers. However, due to the fast-paced growth in the container community, it is time to update that and we will add a post to dive deeper into that. Frank Reno is a senior technical product manager at Sumo Logic where he is focused on all things containers, orchestration and open source. Frank works with customers and our product teams to design and build solutions for Sumo Logic customers leveraging technologies like Docker and Kubernetes. He is also an active contributor to Sumo Logic open source solutions and to the general open source community. More posts by Frank Reno.